Negatives and photographs of Menninger family members. Includes Karl Menninger and his children (Robert, Martha, Julia), C.F. Menninger and Flo V. Menninger at home in the yard, wedding anniversary photographs, Edwin and Edwin Menninger, Jr.. 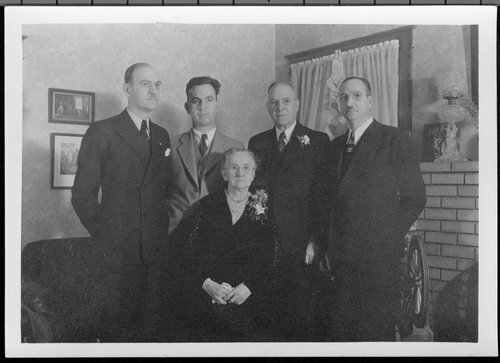 The Menninger family, 1930-1939 - This is a Menninger family portrait from January 15, 1935, on the occasion of Dr. C. F. and Flo Menninger's 50th wedding anniversary. Flo is seated. Standing from left to right are Will, Edwin, C. F. and Karl.